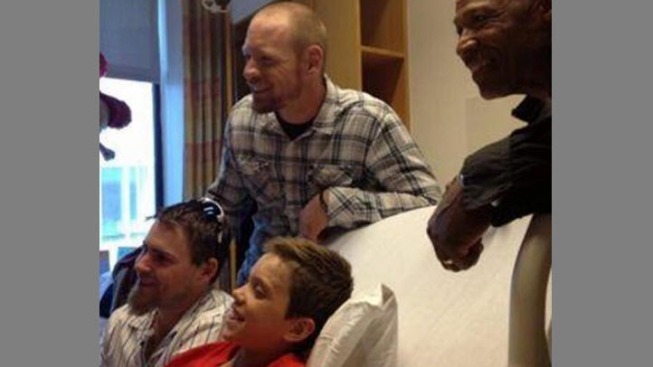 A week to the day after the twin blasts shook the Boston Marathon, an 11-year-old Martinez boy still hospitalized from the bombings got a visit from the Oakland A's. First baseman Brandon Moss, right fielder Josh Reddick and first base coach Tye Waller dropped by to see Aaron Hern in Boston on Monday. Earlier in the day Reddick tweeted: "Brandon Moss and myself headed to children's hospital to help brighten some people's day! Hope we help. #BostonStrong"
An 11 year old boy who was seriously injured by a piece of shrapnel is recovering in Boston. Jodi Hernandez talked to the boy's grandmother. The team is in town to play a three-game series against the Boston Red Sox. Aaron is still at Boston Children's Hospital, where he is recovering after the second bomb blast left shrapnel in his leg. His family said that he's been making "great progress," although it's unclear when he'll actually be released from the hospital. Last week, First Lady Michelle Obama visited Aaron and other patients injured in the blasts. Aaron's doctors said he is doing much better. Surgeons were able to close the largest shrapnel wound on his leg during a second operation last week, according to mulitple reports from the family. His mom's Facebook post called the surgery a "huge step forward." Aaron was with his father, Alan, his sister, Abby, and two family frien ds cheering on his mom, Katherine, as she finished the marathon when he was hit by shrapnel from the second bomb during Monday's twin blasts at the Boston Marathon. His dad said he was just six feet away from the device. Aaron turns 12 on May 1 and the family hopes to be able to be back home in the Bay Area by then. Alan Hern appeared on the Today Show last week along with Aaron's doctor.